This is Chabrier’s only attempt to set a narrative poem and he seems to have tired of it quickly. He must have known the celebrated Saint-Saëns setting published in 1855. Of Hugo’s thirty-two verses Saint-Saëns set fourteen; Chabrier set eight and, of these, six were also set by the older composer. We thus have the unlikely scenario of two settings of Hugo with the same title but which are rather different songs from the point of view of their texts (they do not start with the same words for example). The Saint-Saëns has survived because it actually does tell a story (the pruning of Hugo is cleverly done) with some sense of ongoing development within a certain amount of episodic variety. Although Chabrier’s story makes some kind of sense, the lack of those six strophes denies his setting the impression of an unfolding story. Both songs are in 2/4 with a vigorous tempo. One must admire Saint-Saëns’s skill in making a long and effective piece out of unpromising material – the rather dry and uninspired little motif with which his song opens. But how much better Chabrier captures, right from the start, the spirit of the festive joust with music which rattles jovially between the hands. This is ideal for the composer’s marking of ‘Impétueux!’ and the sheer pace of words that go by with these fleeting musical dactyls creates a real sense of excitement. The sound of galloping horses thundering through the lists is somehow built into this music with its subtle touches of modal colour the better to evoke medieval times. One senses that it might have been Chabrier’s irritation with Saint-Saëns’s rather prim musical vocabulary that prompted him to this spirited riposte by way of musical joust. We have no complaints about the party atmosphere brilliantly evoked here; one easily senses in this glittering scherzo the brio of a great state occasion. The trouble is that it is all over too quickly. The lack of contrasting episodes (and changes of tempo) for the demise of the page and the ministrations of the priest (Saint-Saëns makes clever use here of hackneyed but effective churchy harmonies) makes the return home of these travellers take place almost as soon as they have arrived at their destination. In his early songs Chabrier is capable of creating long strophic constructions that strain the patience of the listener: here he has gone to the opposite extreme of brevity. Saint-Saëns, in allowing the Lady Isabeau into his setting (she mourns the death of the page) introduced a gentle foil to the aggressive manliness of the rest of the poem. 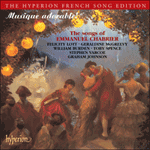 It is a pity that Chabrier chose to ignore this vignette in Hugo’s text; the composer was a master at depicting feminine tenderness, and such a contrast might have rounded off his ballad, giving it the balance that it lacks in its present form. That Chabrier was not satisfied with the work is shown by the fact that a version of this song exists with entirely another text. This is titled Le soldat du roi with a poem by Georges Brillant; it seems that the new lyric (about a young and handsome captain rejoining his regiment) was grafted on to the music at a later date. There is no evidence that Chabrier himself was party to this arrangement.